The Prairie View A&M men’s basketball team remained undefeated in Southwestern Athletic Conference play with a 78-74 win over Southern (4-11, 0-2) Wednesday night in the William J. Nicks Building. Gary Blackston scored a team-high 24 points and added four rebounds as the Panthers (5-11 overall, 2-0 SWAC) won back-to-back games to open conference play for the first time since 2010. Zachary Hamilton scored 18 points, Austin Starr added 14 points with five rebounds and six assists, and four steals and Dennis Jones scored 11 points with three rebounds, five assists, and five steals. Jamar Sandifer led Southern and all scorers with 26 points. Five Tigers reached double figures in points as reigning SWAC Player of the Week Derrick Bruce stayed hot with a 25-point, seven rebound performance. Trayvon Reed notched a double-double with 17 points, 12 rebounds, two blocks and a steal. Donte Clark tallied 13 points, Cainan McClelland had 12 points and Brian Carey scored 10. Texas Southern (2-13, 2-0 SWAC) held a heavy advantage in rebounds over the Braves 45-18. 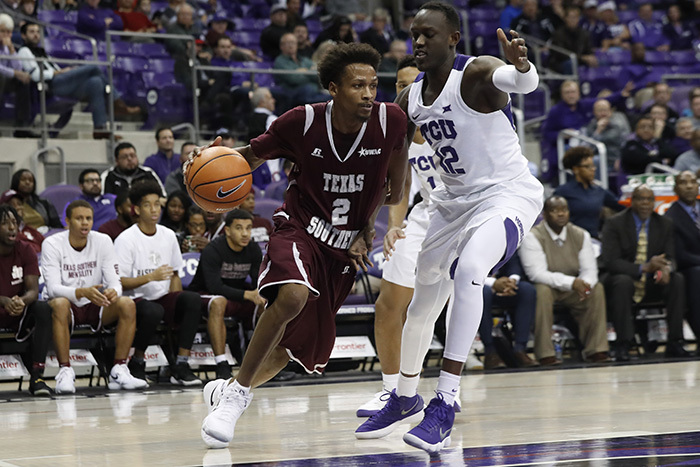 Texas Southern was without leading scorer Trae Jefferson. A.J. Mosby and Devon Brewer had 14 points apiece to lead Alcorn State (4-11, 0-2 SWAC). Trailing by seven at halftime, Alabama State took their first lead of the second half with under six minutes to play and ran past Grambling State 74-66 in Southwestern Athletic Conference (SWAC) play Wednesday night at the Fredrick C. Hobdy Assembly Center. Branden Johnson led Alabama State (1-13, 1-1 SWAC) with his second double-double of the season with 13 points and 10 rebounds, including six offensive rebounds. Jacoby Ross led Alabama State with 14 points, while Reginald Gee added 11 and Ed Jones 10 in the win. Ivy Smith, Jr. led Grambling State (4-11, 0-2 SWAC) with 17 points and five rebounds, also adding four steals and three assists. Anthony Gaston added 13 and Axel Mpoyo added 13. The Tigers shot 39.6 (21-of-53) percent from the floor and 20 (3-of-15) percent from beyond the arc, and 60 (21-of-35) percent from the free throw line, while turning the ball over 19 times. Alabama A&M (1-14, 1-1 SWAC) came back from an 8-point deficit in the first half and trailed just 30-26 at halftime, but were unable to secure the victory as they fell to Jackson State (5-10, 2-0 SWAC) on the road, 59-56. The back-and-forth game featured four lead changes and five ties. The Tigers hit a layup with 1:42 left, giving Jackson State a 57-56 lead and made a pair of free throws with 23 seconds left for a 59-56 lead. Petty’s last second three-point attempt caromed off the backboard as the time expired. The Bulldogs held a slim 33-29 edge in rebounds while topping the Tigers 4-1 in fast-break scoring. Jackson State outshot AAMU 43 percent to 40 percent from the field and 32 percent to 27 from three-point range. The Tigers were 9-of-12 (75 percent) from the free throw line while the Bulldogs connected on 10-of-12 (83 percent). Arthur Johnson led the Bulldogs in scoring with 11 points and totaled three rebounds and three assists. Andre Kennedy tallied 10 points and led with a team-high five rebounds. Two playoff teams from last season meet in Atlanta. The Panthers go on the road for the first time in the CIAA. Morehouse set to host camp for second year in a row.